Posted: August 14th, 2011 under 6M, Hamradio, Soundclips. This was an aurora out of the ordinary. I knew there had been a cme on the sun, so one might say it was expected. I noticed a few OH stations were spotting aurora, but I couldn't hear anything here. After maybe 20 minutes, the aurora increased. Since all the LA/SM tv-transmitter are qrt, I watch 49750 +- for aurora signals. I started calling and got an answer fairly quickly. The aurora didn't seem that good, but signal strength on the stations I worked, increased after a little while. 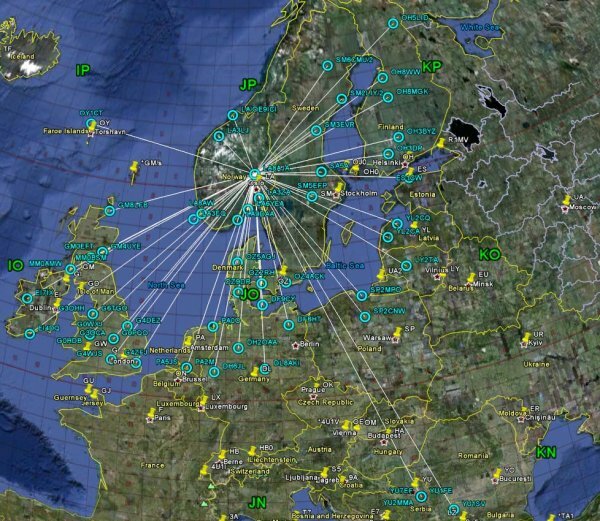 I I worked SM/OH/LA stations at first, then I tried a bit north-west and worked several GM stations. An EI station called in, and at that time, I knew the aurora was really good. I don't work EI stations often on aurora. All of a sudden, YU2MMA spots me on aurora. That's kinda strange, since the nature of the aurora makes contacts to the south over 1000km extremely rare, if not impossible. This was over 1900km. I heard YU2MMA calling me and answered him. It was an aurora signal and we completed the contact. I worked a few more contacts and YU7EF called in. He wasn't too strong either. I was beaming around 40 degrees at the time. After our contact, I turned to around 315 degrees. YU7EF came back much stronger this time. I worked a few G stations and then YU1FE also called in on aurora. After 3 more contacts, YU1SV called me on aurora as well. This was quite exciting and very rare indeed. YU2MMA made a recording of me where you hear my aurora signal, and after our contact, an LA station calls me with pure tone. The mechanism behind these 4 contacts with YU on aurora, was clearly sporadic-e from YU into the aurora. Another contact worth mentioning was EI4DQ in IO51. This was a 1506km contact on aurora and one of the longest I have made. This was clearly one of the better aurora openings I have ever experienced on 6M. I have had strong openings in the past, but the aurora went too far south for me, that I couldn't work it. I was happy that it didn't do it this time. I worked around 50 contacts in this opening with LA/SM/OH/SP/YL/LY/DL/PA/G/GM/EI/ES/OY and YU. how did you make the map ? Funtastic aurora report Andreas. Keep going with great news. Hi Milos. Thanks for the comment and the qso. It was great fun to work you.